SAN JOSE, Calif., March 22, 2019 /PRNewswire/ -- Vector, the space access company, today announced its GalacticSky division, which has been in stealth mode since 2016. Led by veterans from VMWare and Citrix, as well as satellite innovators, GalacticSky has achieved a major milestone on its path to launch its first GalacticSky software-defined satellite, GSky-1. GSky-1 successfully completed integration at the University of Southern California's Space Engineering Research Center (SERC) at the Information Sciences Institute (ISI) and will validate GalacticSky's mission to enable innovators to easily and effectively deploy space application technology in space. Developed in its Silicon Valley office, and utilizing Vector's patented software-defined satellite technology, developers will no longer be required to build and pay for their own satellites. Instead, they can create an application and host it on an existing satellite or across an ad-hoc constellation made up of satellites all within the GalacticSky ecosystem. GalacticSky will provide future digital innovators the autonomy to develop and test applications in space. "GalacticSky was created with the goal to bring the promise of space-based technologies to a much larger pool of entrepreneurs who don't need to be space experts to build and deploy their ideas," said Shaun Coleman, co-founder, chief sales and marketing officer at Vector & SVP/GM GalacticSky. "By creating a space-grade cloud computing platform in space, GalacticSky ultimately fulfils Vector's mission of extending access to space and the team at USC is a great partner to support us in our endeavor." 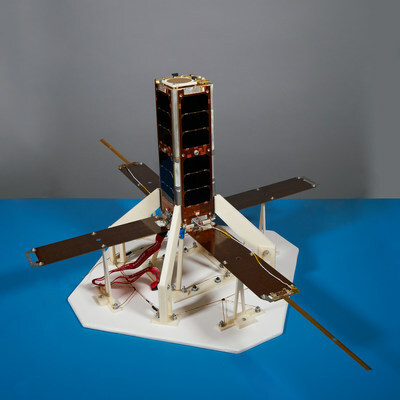 Led by Professor David Barnhart, former DARPA program manager, USC astronautical engineering research professor and director of SERC, the primary mission of this microsatellite is to serve as an on-orbit testbed for GalacticSky and three advanced technology payloads. Following its launch, the satellite will be controlled remotely by Vector and monitored by the SERC research team from a ground antenna at the USC campus and from SERC in Marina del Rey. The primary mission is scheduled to be completed within 90 days once launched, but the satellite will continue to operate and provide system performance data for several years. "Joining forces with Vector on the GalacticSky satellite mission was an overall great experience for the USC Space Engineering Research Center team," said USC Research Professor David Barnhart, Director of the Space Engineering Research Center (SERC) at USC's Information Sciences Institute (ISI). "Working with industry experts in this environment allows direct transition from theory to practice, within budget and schedule constraints not typically included in normal schedules." CrossTrac Precision Timing Board (PTB) - Combines the short-term precision of an atomic clock with the long-term stability of a GPS receiver to provide users with a programmable precision time reference. The test data from PTB ground and flight demonstrations have been purchased by NASA. Cateni Processor/Sensor Flight Board (PSFB) - Integrates advanced command and data processing components with ethernet interfaces for IP based communications between the vehicle and payloads, two Teledyne radiation dosimeters (one shielded by VSRS and the other exposed to space), and integrated GPS with the groundbreaking MEMs integrated 6-axis MotionTracking device that combines a 3-axis gyroscope, 3-axis accelerometer, and a Digital Motion Processor. TUI Versatile Structural Radiation Shielding (VSRS) - VSRS is a novel, 3D-printed radiation shielding technology developed by Tethers Unlimited under Air Force Small Business Innovation Research (SBIR) funding to provide a lightweight, customizable, and cost-effective solution to enable commercial off the shelf (COTS) electronics to operate reliably in the space radiation environment. "There is no substitute for operating in space and to that end our challenge was to get GalacticSky on orbit as soon as possible. Working with USC's SERC team at ISI was a natural fit since they had a mission proven satellite in need of a payload, and GalacticSky needed a satellite to integrate with," said Dr. Darren Garber, president of Vector Government Systems. "The integrated Vector and SERC team successfully delivered GSky-1 on time and on budget within six months. Now GalacticSky is ready to meet our users' needs, and with SERC, we're able to move as fast as our customers." USC Viterbi has a strong legacy of innovation in space engineering and exploration. USC Viterbi School of Engineering is one of a very small group of top schools with distinct astronautical degree programs. To date, school researchers have created innovations in spacecraft propulsion, space science, space environment, space communications, satellites and materials. Astronaut Neil Armstrong was a USC Viterbi alumnus, and the school has a dedicated Space Engineering Research Center at the USC Information Sciences Institute co-managed with Viterbi's Department of Astronautical Engineering. The school maintains strong connections with pioneering space organizations and alumni who design and build rockets and space launchers, communications and direct broadcasting satellites, navigational systems, crewed space vehicles and planetary probes.